Cats and dogs can suffer in the hot weather just as much as people can! 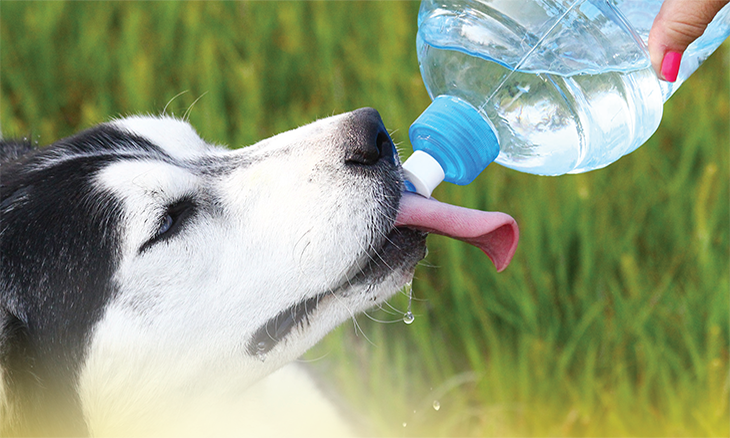 — Our beloved animal companions are very susceptible to heat stroke…even at temperatures as low as 80 degrees! — Fortunately, there are some basic precautions you can take to keep them cool, comfortable and safe all summer long! or salivate excessively. — They may feel dizzy and weak, which can result in them staggering or even collapsing. — As the heat stroke advances their mouths can become very dry and pale in color and they will quickly become unconscious. • If you see any of these signs in your pet, bring them to the veterinarian right away if at all possible. — If a vet can’t be reached, do your best to cool them down in the meantime but putting them in a tub of cool water or running cool water over them. — Make sure the water hits their skin and doesn’t just bead off their fur. — Pay close attention to their undersides… their stomachs and around their legs. — Run the water over their tongue and mouth, but be careful not to run it down their throat… you don’t want to choke or gag them! • An ounce of prevention is worth a pound of cure… do everything you can to keep them from entering the danger zone to begin with! • Never leave your pet in the car… even with the window down.— A panting dog produces heat and humidity every time they breathe out…this hot, damp air will re-circulate in the small space and will quickly build to frying hot temperatures! — Not in the shade, and not even for a few minutes… pets are as susceptible to heat stroke from sitting in the car as a newborn baby. • Consider trimming or shaving the coat of a longerhaired pet.— They will feel much more comfortable, and you will have less shedding to contend with. — Just make sure to leave enough hair on to prevent sunburn! • Walk your pet during the cool morning or evening hours after the sun has set. — It will be less taxing for both of you! dish and shade. — If you aren’t home to rescue them, the consequences can be fatal. • Make sure your water bowls are the heavy kind they cannot tip over. — A full bowl of water can become an empty one with the wrong nudge of a nose! • Keep the water as cool as possible! — Leave the bowl in the shade to keep it from overheating and evaporating. — Freeze more water in small plastic butter dishes to make an extra large ice cube that will last for hours. • My A/C repair guy assured me that the water from my air conditioner drip line is some of the cleanest water available. — You can leave a water dish underneath the drip line for a continuous supply of clean drinking water! • Keep a shady area available for pets to lie in when outside. — If you don’t have trees, invest in a doghouse, storage shed, or even a small pop up tent for your pooch to lie in. — Cats don’t need as much space; trailing vines planted along your fence line will give them a nice shady spot to hide in! • If you bring your pet hiking or camping, make sure to carry a collapsible water bowl with you. — Many of them can be folded and tucked inside your pocket or even hung on your belt. — When you stop for a water break, make sure they get some too! • Keep your air circulating whether inside or out… if you don’t have a/c make sure to have fans or open windows to catch the breeze. — If you are camping, don’t leave your pet in an enclosed tent or cabin… it can be just as dangerous as a parked car!